Appearance (0-20): The bright green, black, and white stand out as opposed to the colors usually used for cigar bands, giving this cigar a unique appeal right off the bat. The wrapper has a caramel color to it, which is also inviting for a lighter cigar. The feel of the wrapper was oily but rough… it’s a feel that one might call ‘rustic’. 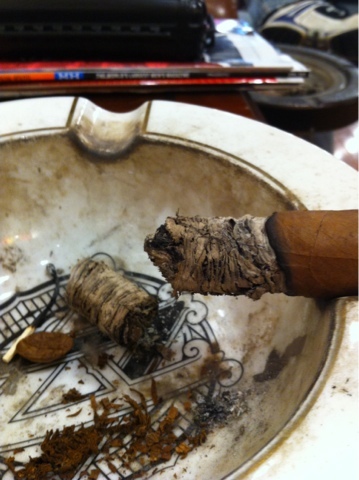 There are very thin veins along the stick, with a small noticeable blemish or two on the tobacco itself. Otherwise, it’s in great shape. Construction (0-20): Initial feel was a good one, although I had some fears that it might be a little too tightly packed. The cut revealed very little debris, but when I went for a cold draw my fears were confirmed – it was over packed. After snipping some back, and upon lighting and burning a bit, it loosened up slightly (although unfortunately not to an ideal state). The burn was slightly uneven and jagged, but it burned cool throughout while billowing out thick smoke. The ash only held for an inch to an inch and a half at a time, and it displayed a salt and pepper coloration. Strength (0-20): Medium strength reigns supreme here, with it sitting nearly in the middle of everything. 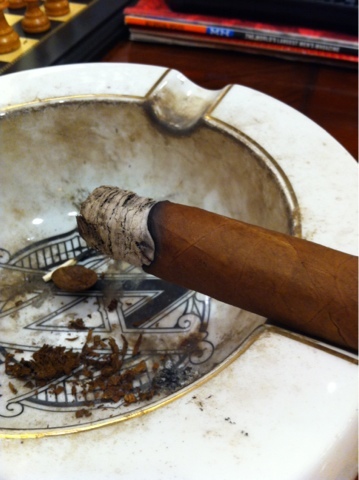 Slight variations occur throughout the cigar, which is very well done as they aren’t abrupt changes. Flavor (0-20): A host of flavors are found throughout the OSA Sol, ranging from pepper all the way to sweetness. When beginning the smoke I found myself greeted by a really rich earthy core that showed some nice hits of charred wood. When I say charred wood, I’m thinking of the type of taste you get in your mouth when sitting by a campfire. There is a nice chocolate-caramel type of taste that lingers on the edge of the tongue too, balancing with a bitter taste (perhaps something of a slight coffee flavor) that’s resident here. The retrohale reveals a hunk of pepper spice to the party, with just a tad of sweetness. When you reach beyond the first third, the flavors that were there previously seem to take turns with which one will be in the spotlight, but the earthy core remains through it all. This continues along until the OSA goes out. Value (0-20): I can’t give the OAS too much of a knock, as the price is low for the size and quality of the stick at under $6 per. Additional Notes: Smoked at CI, paired with water.